Kopperl I.S.D. 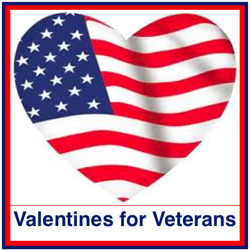 will be hosting their 6th Annual Valentine's for Veterans event in their gymnasium at 10am on February 14, 2019 (Valentine's Day), As part of their 50th Commemoration of the Vietnam War partnership effort (an initiative of the Department of Defense), there will be student presentations and speeches given to honor our veterans . Keynote speakers will be Martha West and Lt. Colonel Tommy Williams who are both members of the Kopperl ISD faculty. West is a kindergarten teacher at Kopperl ISD and has been with the district for 40 years. She began her education at Blum ISD for 10 years and then graduated from Rio Vista HS in 1971. She is a Vietnam veteran's wife who also serves as the chair of the school’s 50th Commemoration of the Vietnam War Partnership Committee and instills a sense of patriotism in her students by recognizing the efforts of war and military veterans. In 1980, Major Williams had the opportunity he had been preparing for throughout his civilian and military careers when he was "called to Active Duty" as an Air Force Instructor Pilot. Col Williams was the Commander of the U.S. Forces in the Ukraine during multi-year Rough and Ready exercises where U.S. civilian and military personnel worked disaster response missions with personnel from the Ukraine, Georgia, Azerbaijan, and Moldova. Col Williams (Ret) teaches math at Kopperl. He uses the training expertise he learned in the Air Force to teach in ways that reach every student. Anyone wishing to come and help celebrate and honor all our veterans (of any time of service) and their families, is encouraged and welcome to attend. We look forward to this special event and appreciate the efforts of all involved in organizing this tribute to our veterans.